Woke up this morning to the bright sunshine and heat, all I could think of was to eat frozen treats! But since I didn't have any and it was probably not a good idea to have a popsicle for breakfast, I decided to dress like one instead. I adore this orange pleated chiffon dress... fun, bright, and summery! I paired it with a vintage seafoam belt, these 70s embroidered platforms, and a lovely 60s floral bag that has the perfect orange accent to go with my dress. Oh, and did I mention you can get your hands on this cute little dress? It is available in my shop - it's not her, it's me. Orange pleated chiffon dress from my shop it's not her, it's me. Engagement ring and rings from ebay and f21. 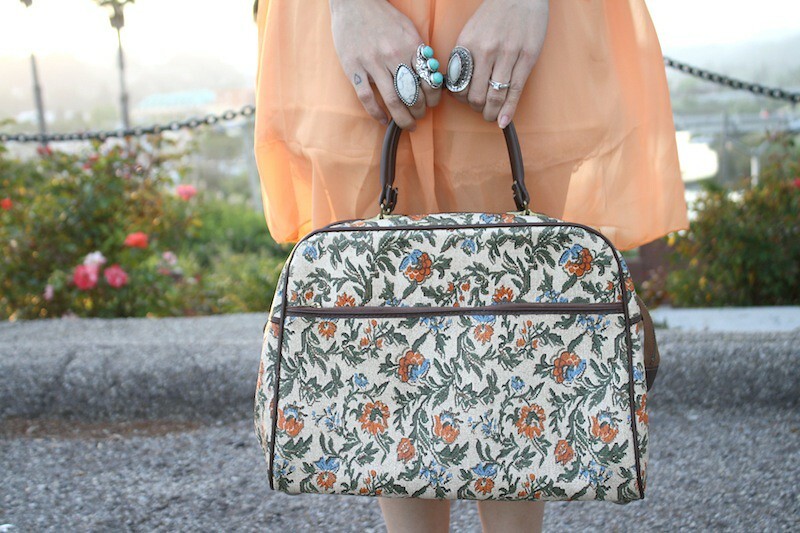 Vintage 60s floral bag from greatest friend.